Outside Vietnam, when people talk about Vietnamese food, it’s simply Pho, ‘the sandwich’ and maybe if you’re lucky, Vietnamese Coffee gets a mention. But food in Vietnam is so so much more than that! 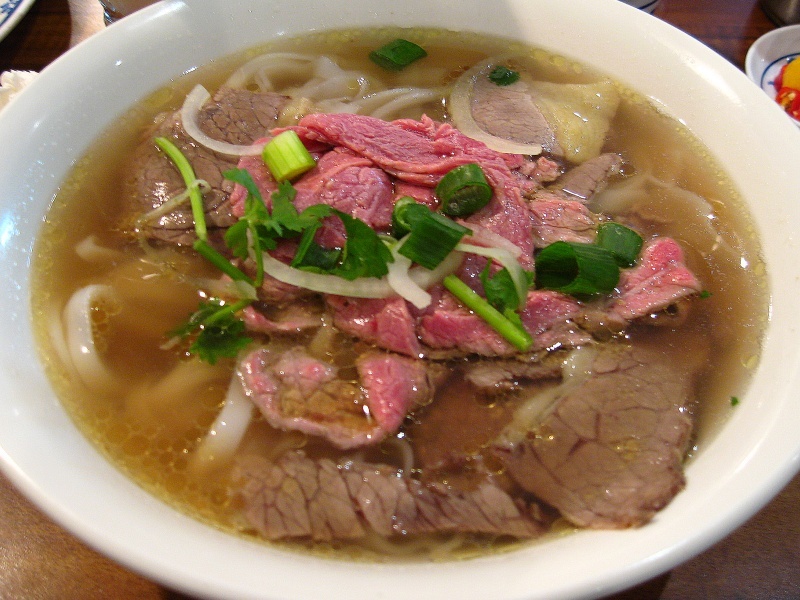 In the land of noodle soups, there are probably hundreds of variations of Pho, and even the same type of Pho can be wildly different in each district. Wherever in Vietnam you go, you should definitely make it a point to try out these 9 Best Vietnamese street food experiences we’ve shortlisted. We promise you won’t regret it. This experience is truly one of the most coolballs BBQs I’ve ever had after travelling to over 40 countries around the world. You literally sit by the sidewalk with motorcycles flying by at a rate of 48 motorcycles/minute, grilling your meat on a flower pot. They will pour some flaming charcoals into it before slapping a little metal grill on top of it, and there you go. Start roasting! This style is usually used for thinly sliced meats where you can wrap it with a variety of fragrant Vietnamese vegetables which always comes in a ‘oh so fresh looking bamboo basket’. Or with the classic Buncha where thin vermicelli is sort of braided together to form squares. Sounds weird? It will blow the tastebuds off your tongue! Really amazing texture. And of course, that experience, provided you steer clear of the motorcycles. Now for the shocking. Nothing delights the street food vendors more than seeing a foreigner try this for the first time. When i tried it for the first time, i had a strange craving for a normal egg. And i was surprised to see a vendor selling only hard-boiled eggs, by the cartloads. 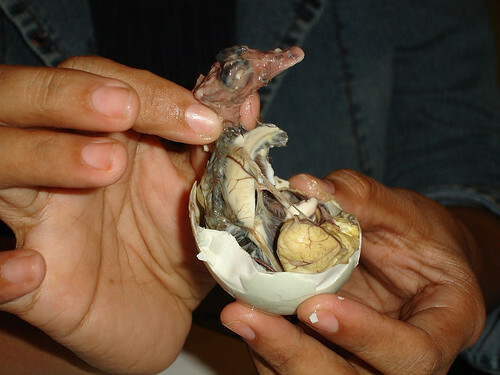 You should’ve seen the surprise on my face when a little baby duck fetus emerged from the egg (not alive of course, I’d have gotten a heart attack with it on my plate and so close to my face). And so i thought i was really having a normal egg. Turns out it’s much more complicated than that. For a start, there’s more than just yolk and white to choose from. You choose the wings, the feathers (if you’re lucky), feet, head, some gooey substance, and all sorts of unidentified objects. So… enjoy it and live to tell the tale. Go on and make the street vendor’s day. 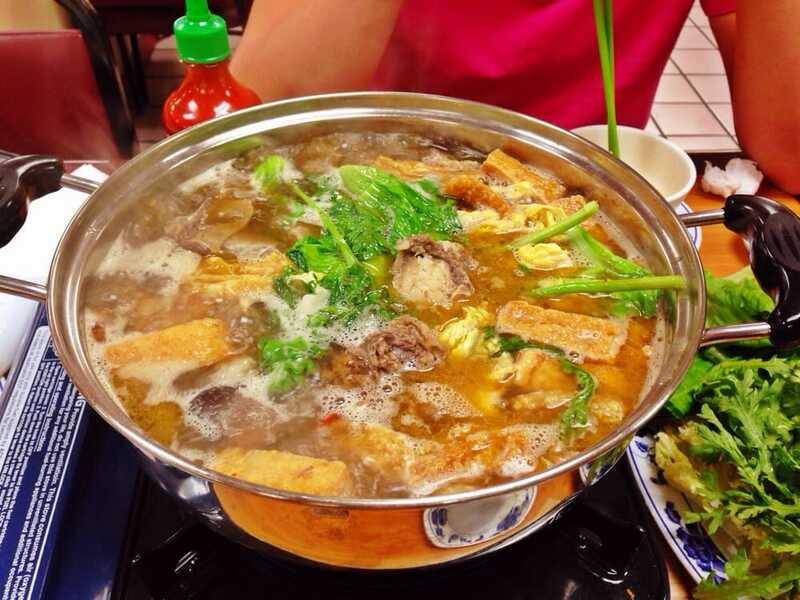 Nothing too amazing here, it’s a normal hotpot. The soup is kinda clear and nice and the vegetables again have as much variety as the amount of pho available. The bomb would be to have this in the cold weather on a windy sidewalk, or up in the hills of sapa at night. That’s what makes this the experience. Sometimes, you need some help from the outside. These little slender beauties look amazing when you pile them up in a pho cuon pyramid. They seem like they’re never ending and they’re so easy to eat, stick by stick, it’s amazing. This is the classic version, and for the more innovative stalls, there are infinitely many versions how they present this in addition to the classic one. For one, the deconstructed fried Pho Cuon looks nothing like the original one, but packs the same interesting punch worthy of a michelin restaurant. ‘Deconstructed fried pho cuon’ – A sure winner with the michelin critics I’m sure. Now for the cousin of Pho Cuon. They have the same skin but different feelings, fillings of course i mean. Pho Cuon comes out at night, and banh cuon usually only in the day. Schizophrenic i say. Banh Cuon is packed with a medley of minced meat with such an amazing aroma. The skin is wiggly soft and its topped with fried shallots and dipped in a nice tangy sour vietnamese sauce where you can choose to add chilli or not. I can finish 20 of these in a moment. The skin’s really like baby skin. So soft and so smooth. The highlight before eating is watching the master make the skin. The just spread this rice paste over a sieve and cover it with this giant magic bamboo cover that resembles a super upsized dimsum basket and when they open it, they use a thin little stick to lift the whole piece off. Some sorcery. The quintessential Pho. Everyone knows this as the posterboy of Vietnamese food. But hey, that’s like thinking all Americans look like Brad Pitt. And even Phos themselves have way too many classifications and names and types and species and what not to even talk about. Just slurp all of them up if you get the chance. They’re all good. The other well known international Vietnamese star. 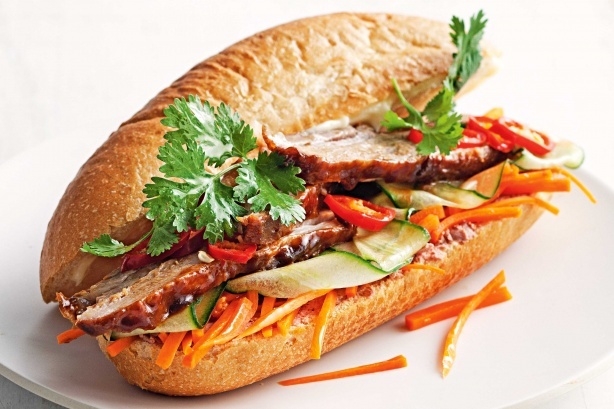 The Banh Mi. Again the combinations for this is overwhelming. The only consistent trait is the fresh crusty bread and the sheer variety of ingredients you would find inside one Banh Mi. Each one packs a punch in flavour, and they all come in stages. You get a shot of fresh coriander, then a waft of pate aroma and a juicy bite into caramalized pork belly before the soft butter on the inside of the bread sets in, and yada yada. Its truly a gastronomic explosion wrapped nicely in a bun. I know what you’re thinking, but no, its not the same as your hamburger. You can find this all over Vietnam and in the tourist districts as well. Little stools spilling out onto the sidewalks with bodies hunched over a little stove wrapped with aluminium. This is the classic Vietnamese hotplate BBQ. Their meat flavours are special and they really pack a spurt of oil and juices. Arm yourself with some Beer Hanoi or Saigon Beer while you have this, and you’ll have the time of your life. Coffee certainly has its place everywhere in Vietnam. You can go to countless cafes where they sell nothing but coffee. You sit on a really mini stool on the side walk and again watch motorcycles go by. It’s so good the roast literally wafts up to the roof of your mouth, sending you to cloud nine. But egg coffee is even more amazing. 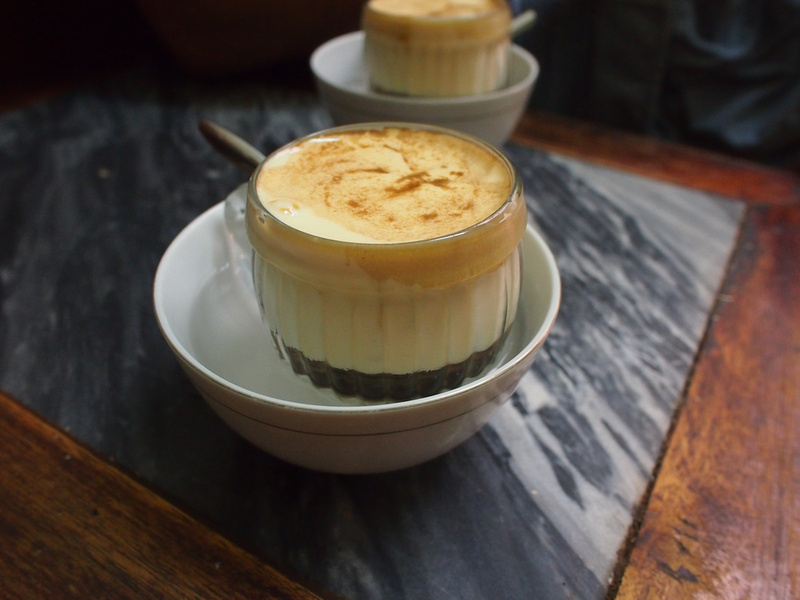 They blend this egg in sweet condensed milk and then add it to the coffee. It’s sort of like a quasi dessert, where you whip off the sweet top little by little with a spoon before slurping down the rest of the coffee. It’s epic.